Mumia before and after diabetes crisis. Political Prisoner and journalist Mumia Abu-Jamal has been subjected to over three decades of torture from the US prison gulag. His political imprisonment has placed his life in serious danger, this time not from state execution but instead from extra-legal medical neglect. 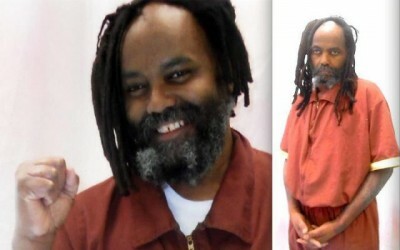 The prison state has continuously failed in its efforts to murder Mumia through official means and has thus decided to refuse the former Black Panther adequate medical treatment for diabetes. Meanwhile, Boston residents of all classes await the verdict of whether the alleged “Boston bomber” Dzokhar Tsarnaev will receive the death penalty or life in prison. The event that faithful day remains shrouded in questions , but most of the city has accepted the dominant narrative put forth by the FBI and Boston Police Department. The War on Terror that produced the “Boston Bombing” and Mumia’s struggle against the prison state are intimately connected. For Mumia to live with freedom and dignity, the US imperial order behind the War on Terror must die. Mumia Abu-Jamal’s existence as a political prisoner has been repressed by the establishment, while the War on Terror is a household name in the US. This is because the War on Terror serves the objectives of imperialism and Mumia does not. Mumia joined the Black Panther Party at fifteen and served as the Philadelphia Chapter’s Ministry of Information. He used his talents in journalism in service of Black people both in the BPP and after. This landed him on J. Edgar Hoover’s COINTEPRO list of Black liberation fighters to watch and suppress. In 1978, Mumia covered the Philadelphia police department’s siege on the MOVE Organization. His critical investigation of the Philly PD’s role in repressing MOVE led to his ouster from the journalism industry. In 1982, Mumia was framed for the murder of police officer Daniel Faulkner and sentenced to death. The context of Mumia’s imprisonment is at the essence of US imperialism’s War on Terror, which could be better named its war of terror. In the film Manufacturing Guilt, Mumia’s frame-up is blatantly exposed through court documents and investigations. Yet, Mumia has lived much of his life in prison, mostly in solitary confinement. What explains this injustice and how does it relate to the current War on Terror? In Still Black, Still Strong, Dhoruba Bin-Wahad explains how the FBI’s counter insurgency war on the Black Panther Party chapters and leaders like Mumia established for local police departments a direct link to Washington’s war and surveillance arsenal. Washington’s war on Black liberation fighters precipitated the first SWAT team operation in 1969 and the FBI’s declaration that the Black Panther Party was the “greatest threat to the internal security” of the US. The war on Black freedom that jailed Mumia created the technical capacity for the War on Terror. Mumia’s story, one shared by numerous US political prisoners sentenced to die in the cages of the prison state, contains in it the seeds that sprouted the rise of the massive War on Terror. Russell Maroon Shoatz, Oscar Lopez Rivera, Leonard Peltier and scores more faced trumped up charges from the state as part of US imperialism’s counter insurgency war on dissent generally and the Black liberation movement in particular. This war has been expanded to meet the needs of US imperialism, which in its current form has produced a potentially explosive situation domestically and globally. The sharpening contradictions of never-ending war and increasing poverty and privatization wouldn’t last long if the counter insurgency war on Mumia and the Panthers hadn’t provided the blueprints and technical support for the mass expansion of the War on Terror’s primary tools: war and surveillance state. So, even though the justification for each and every War on Terror intervention or policy since 2001 are dubious at best, the fear of the Muslim/Arab terrorist rekindles the same fear in white America that the Black liberation movement ignited over four decades ago. The Black Panther Party and their partners in struggle were deemed criminal in every way and many were falsely charged with the murder of police officers, the highest form of offense in the eyes of white America. The War on Terror built off this strategy by throwing the Muslim community into the racist war on the oppressed as a means to control the dissent of the entire population. That the US imperial machinery is complicit in, and a sponsor of, jihadist terror and proxy war matters as little as the innocence of political prisoners when it comes to preserving the Empire and criminalizing all resistance to its rule. Mumia Abu-Jamal’s life needs to be saved by any means necessary, but fighting to free him based on his criminal case alone won’t develop the movement we need. One of the primary obstacles to building a concrete movement for the freedom of political prisoners is the privileging of innocence over a movement that links political prisoners to the repression of the imperial state. But Mumia’s innocence teaches us the real purpose of political imprisonment. The War on Terror is a consolidation of the forces that were built by imperialism to suppress the revolutionary ideas of Mumia Abu-Jamal. What we need is a reexamination of those ideas in the service of the freedom of all political prisoners. By studying the War on Terror and the repression of the Black Liberation movement from which it grew, it becomes increasingly clear that imperialism must die for Mumia to truly live.